In this year-end recap, find out what experts think were 2008’s biggest stories. Recovery audit contractor (RAC) audits, Medicare severity diagnosis-related group (MS-DRG) implementations, electronic health records (EHRs), and speech recognition—it’s a small sampling of the challenges, opportunities, and advances that impacted the HIM field in 2008. Couple all that with an intensified focus on cutting costs and increasing efficiencies, and most industry experts agree that the target for HIM departments was in a constant state of motion as they worked in an increasingly complex healthcare arena. Paul Ruflin, a longtime industry veteran in the HIT sector and the current president and COO of Noteworthy Medical Systems, says hospitals began taking EHR implementations to the next level during 2008. While most large hospital systems had made the move to EHR functionality, the momentum increased beyond acute care implementations to other ambulatory services. As EHR implementations become more fully integrated across the community setting, experts agree that there are great opportunities in the quality of care realm, but getting all the kinks worked out will continue to take time. In fact, Vicki Wheatley, MS, RHIA, vice president of consulting services with data integrity solution vendor Just Associates, believes that one of the greatest challenges HIM faced in 2008 was the continued migration to the electronic world while managing a hybrid record environment of paper and electronic data. While new announcements, legislation, and technological advances have represented both challenges and opportunities for HIM in 2008, Wheatley points out that the underlying factor influencing all these areas has been the HIM professional’s role in effectively managing an increasing amount of electronic data. 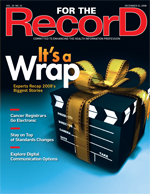 Fuller believes that one of the greatest challenges to managing a hybrid record environment rests in being able to appropriately define what constitutes the legal record—that is, being able to reconstruct a record from various points of entry and knowing what information is out there and how to find it. Ruflin points out that e-prescribing incentives enacted on the federal level in 2008 ratcheted up physician interest in adopting EHR technology. He adds that greater uptake of technology also points toward increased momentum for community connectivity between providers. While not the same model as a regional health information organization or HIE, Ruflin believes the groundwork for communities of doctors to begin looking into options for their own data-sharing options was laid this year. As an incentive for physicians to adopt e-prescribing, the new rule increased Medicare payments to physicians who regularly utilize e-prescribing by 2% in 2009 and 2010 and then slightly less over the following three years. Physicians who do not use the technology would see their payments cut by 1% in 2011 and a maximum of up to 2% for 2013 and beyond. While the electronic movement and tighter staffing budgets laid the foundation for opportunities and challenges in 2008, here’s a look at how the year shook out for more specific functions within HIM. Alongside the mammoth announcement of the controversial ICD-10 implementation date, coding was met with other new legislation, further intensifying the need for solid documentation improvement programs throughout healthcare facilities. Leading the legislative happenings was the decision to take the RAC program from a demonstration initiative to a permanent plan. Health and Human Services was originally directed to conduct a three-year demonstration program using RACs to detect and correct improper payments in the Medicare fee-for-service program. Originally operated in New York, Massachusetts, Florida, South Carolina, and California, the demonstration ended in March and was designed to determine whether the program would be a cost-effective means of adding resources to ensure that correct payments are made to providers and suppliers. At the demonstration’s close, RACs succeeded in correcting more than $1.03 billion in Medicare improper payments, with approximately 96% accounting for overpayments collected from providers. An initial permanent RAC program was set in motion with plans to have four RACs in place by 2010, each covering one quarter of the United States. According to Amy Hodges, CPC, CPC-I, director of content development for Bloodhound Technologies, “The RACs seem to be targeting excessive units on claims and medical necessity,” which made many healthcare organizations wake up to the need for renewed focus on clinical documentation and accuracy. Alongside that urgency, Hodges predicted that most third-party insurance providers would follow suit. Also increasing the momentum for documentation improvement was the continued implementation of MS-DRGs. Add to that increased scrutiny on the hospital and physician level via Internet profiling, and many experts suggest that 2008 became ripe for a new focus on documentation improvement programs. Fuller notes that healthcare organizations are currently approaching and implementing these programs through a variety of different models, but the cornerstone is that they must be linked to coding. Going forward, she believes that these programs will lay the foundation for successful revenue cycle integrity. Present-on-admission (POA) indicators became an area of heightened concern in 2008 after the legislation went into effect in late 2007. Medicare now denies reimbursement for the following conditions if they’re not POA: catheter-associated urinary tract infections, vascular catheter-associated infections, pressure ulcers, mediastinitis after coronary artery bypass grafting, and falls. Three conditions noted as serious, preventable events are also not covered: object left in a body during surgery, air embolisms, and blood incompatibility. While industry experts believe that POA will ultimately improve patient care over the long haul, the bottom line for HIM professionals is that their respective hospitals can expect some revenue loss, once again pushing the need for improved documentation strategies and more accurate billing. Ian Wilson, chief financial officer with SPi, points out that the choice to use a combination of both onshore delivery from within the United States and offshore delivery is not based on cost alone. With the continuing progress of EHR implementation alongside speech recognition, many industry experts question whether the practice of dictation and transcription in its current form will continue to exist, but McGill believes that for the time being, the demand for services is here to stay. In the meantime, some MTs are beginning to make the transition from traditional transcribing to editing, a role that many believe these industry professionals will play as the electronic movement continues forward. Editing documents produced via speech recognition technology is a relatively new work experience for many MTs, many of whom are used to creating a transcribed report from scratch. Industry professionals point out that editing requires a different skill set, one with critical thinking skills where words are viewed, recognized quickly, and placed appropriately and accurately in context. Then, there’s the contentious issue of pay, a subject that has come under much scrutiny and debate. Industry professionals contend that editors will have to edit twice as much to make the same amount of money as they did transcribing documents. And while some are preparing for the future, others are resisting, McGill says.